The Following is a transcript of an article which appeared in the Menominee Herald Leader, circa 1922. Included are illustrations that appear in the article. A lot of youngsters, scattered all over the world, conscientiously working for the advancement of a great art, not satisfied until the voice of their transmitters have reached to the distant parts of the earth, are contribuiting (sp) factors to the success of one of Menominee’s great industries. Thousands of these enthusiasts are depending upon Menominee for the apparatus of efficiency with which to further their ambition to make a record for net circuits and long distance. These are the radio enthusiasts. But they would mean little to us if Menominee did not have the capital, brains, and experience to meet the situation. So fortunately, we have the Signal Electric company which makes the things that make amateur wireless operators in all parts of the world proud of their proficiency. Fully cognizant that the future holds much in store for those that are “hooked up” commercially or industrially with radio communication, the Signal company is preparing to meet the vastly increasing demand for instruments that is bound to come. Pushed almost to the limit at the present time for radio instruments, the feature of its various products, this Menominee plant is, at the same time, establishing a record for superiority that is bound to be reflected in future business and which will be maintained by the energies that are today presiding over the destinies of what may head the list of Menominee’s industrial institutions. The moving spirit in the Signal Electric company is Charles E. Hammond, who, before he became a part of this concern was employed in the capacity of auditor for the Tideman Electric company, which, for many years prior, were prominent in the electric field, being large producers of fans and motors. Approaching the time when Henry Tideman moved to Cairo, Ill., Mr. Hammond took an option on the Menominee plant, planked down some cold cash and went scouting for other capital to complete the deal. The necessary quantity of the circulating medium was not forthcoming, and Mr. Tideman very kindly agreed to extend the option for 30 days. Before the extended time had expired, Charlie had the coin of the realm. Tideman moved out on October 10, 1919, and the following morning the Signal Electric company was operating, and shipping goods, with lots of orders on the books. The company went along with a fair wind throughout 1920, but during the first nine months of 1921, quite a slump was experienced and weathered. The force of help was reduced to 48. But by the same energy that has always characterized the Signal Electric, a business was worked up until 200 hands were employed, and the plant operating 20 hours a day, with further extensions absolutely necessary to meet the demand for its products. In the month of March, of the present year, the company had three thousand dollars more business on the books than the entire volume of the year 1921. 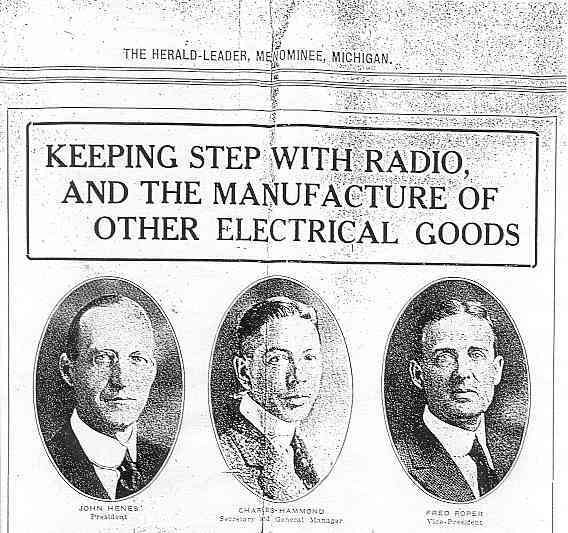 While this remarkable gain in business is the result of the wide usage of radio almost to an extent that people today regard it as almost commonplace, yet it should be understood to be in its infancy, and thus the brilliant future of this splendid Menominee enterprise is easily forecasted. During the past season, $19,000 worth of new machinery has been installed and all paid for in cash.. Other new machinery is imperative to keep pace with the new influx of business. Some of the new machinery is to be installed in the south end of the building formerly occupied by the Art Crafts company, and it will still be necessary to erect new buildings to provide additional floor space that looks like an absolute necessity in the very near future. The activity in all departments is one of the first impressions the visitor gets on entering the plant. Expert mechanics will be seen at very lathe, drill presses, special machines, etc., working at top speed manufacturing the various parts of the products. This is on the first floor..Going upstairs, craftsmen and young women with skilled hands will be seen busy at some special department of finishing. On through the varnish room; to the department where the beautifully finished cabinets are hand rubbed; to the enameling room where metal parts are baked under a 360 degree heat; to the winding of silk-covered copper wires around the radio tuning tubes, is a trip of unusual interest. A thoroughly equipped tool making department is maintained where new tools are constantly being turned out, and those in daily use are sharpened. A special vault contains tools of various kinds, the value of which runs into many thousands of dollars. Each tool is carefully labled and indexed. A laboratory is located near the main office on the second floor where engineers are constantly at work developing new instruments, and in which is located the wireless testing station, where each radio instrument is given a thoroughly practical test before being sent to market. 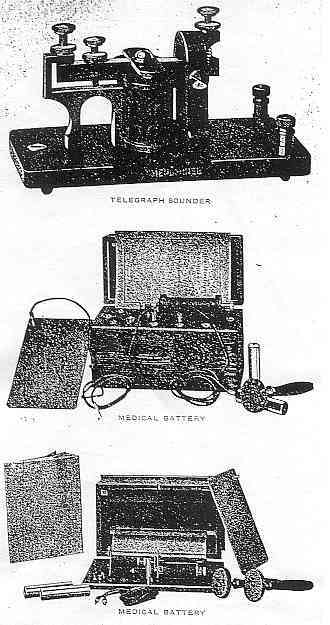 While radio instruments predominate, among the several other products, electric bells, telegraph instruments, medical batteries, and small motors are manufactured in greatb numbers and are being shipped to all parts of the world. Bells, which are second in production, embrace all sorts from house bells to fire alarm gongs. The name “Signal” will be found in the Orient as well as in the occident, orders coming frequently from China and Japan; from Melbourne, Australia; from New Zealand, and all parts of Europe. Signal Electric maintains offices in Hong Kong, China, Japan, London, three in Canada, besides in advantageous distributing points in the United States. The company is capitalized at $150,000 with $125,000 in use, $25,000 in the treasury, and not a share is for sale. Every share is held locally. It is a 100 per cent Menominee enterprise, employing almost 200 people. The remarkable growth of the business of the Signal Electric company has necessitated two additions to the plant-one of 2,500 square feet of floor space and another of 836 square feet. Both of these additions are of brick construction. The company maintains a radio station adjoining its main offices and is now preparing to broadcast musical programs and stock reports that will be received daily by wireless. This will prove of great interest and benefit to those owning radio sets in the local territory. Like Mr. Hammond, who grasped the opportunity here in 1921, the Signal Electric company is losing no opportunity to pick off the business today by being on the ground with a representative where business breaks. The officers are John Henes, Jr., president; Charles E. Hammond, secretary-treasurer, and general manager. The officers, with the following, constitute the directorate: Charles H. Law, Ralph Wells, George L. Hastings, and Alfred Henes.